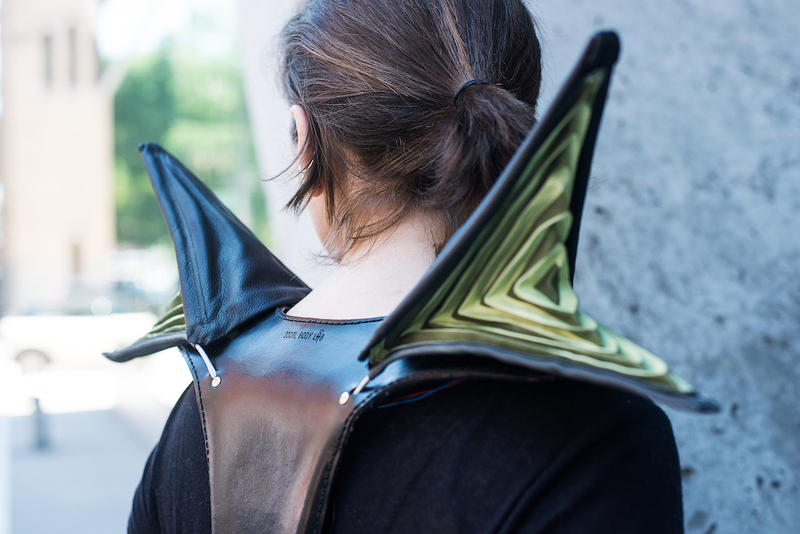 Monarch is a wearable and muscle-activated kinetic textile. It consists of textile forms attached to the shoulders that expand and contract in response to the movement of the wearer’s muscles. 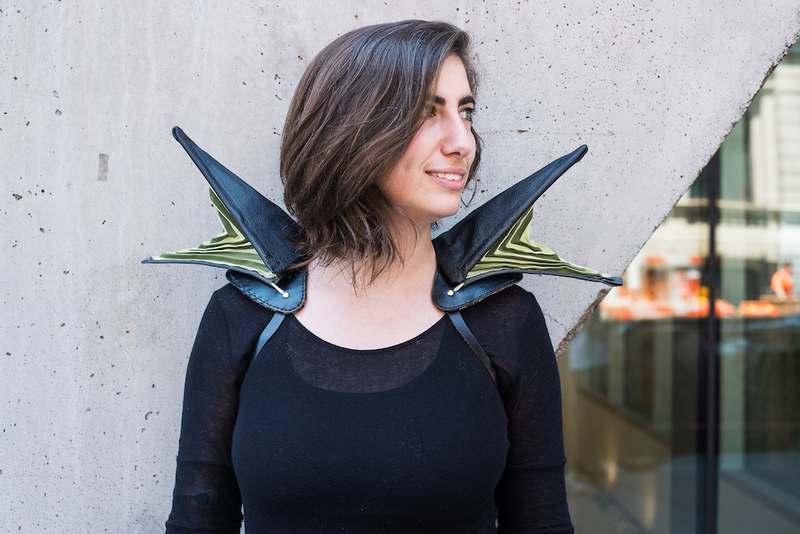 By physically extending natural body language, Monarch explores how wearable technologies can be used as a form of personal expression, as well as how and when they can begin to feel like a visceral extension of self. In designing the harness and pleated structure we took in to account personalization. With a much reduced leather base to house the electronics we set out to make a run of six Monarchs, one personalized to each member of the Social Body Lab. Each is personalized in, leather colour and surface design, wing coverings, as well as, interior colouring and pattern. This personalization was enabled through our use of digital fabrication such as digitally printed textiles and laser cut leather. Should you feel your current wings are ill-suited for an occasion, the new design allows for each wing to be removed and replaced with an alternate pair. The monarch’s servo mount was made and printed so as to simplify the mechanics of moving the Monarch wings and reduce strain on the servo. Hartman, Kate, et al. 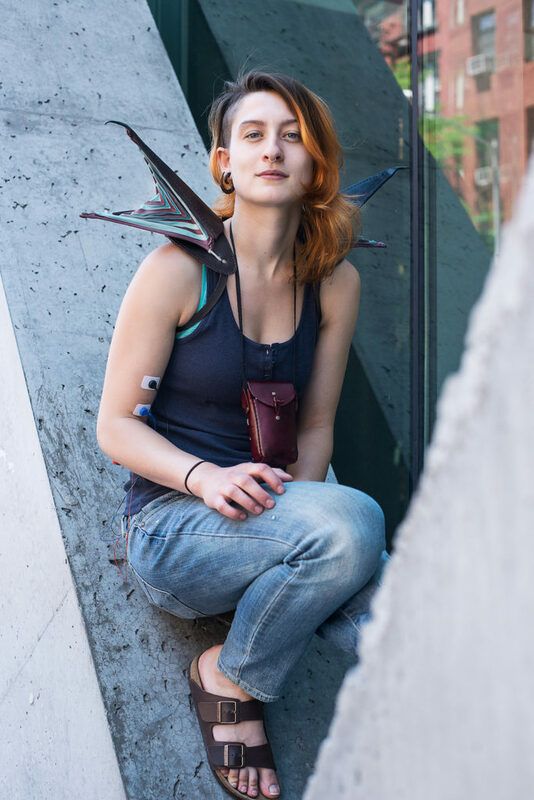 “Monarch: Self-Expression Through Wearable Kinetic Textiles.” Proceedings of the Ninth International Conference on Tangible, Embedded, and Embodied Interaction, ACM, 2015, pp. 413–414. ACM Digital Library, doi:10.1145/2677199.2690875.